Hamara Bharat Mahan hein .. the Nation always cares for its people .. ..
Thousands of miles away, Cyclone Mekunu made landfall on the Arabian Peninsula on Friday night, leaving six people dead in Oman and 30 others missing, according to local officials. Mekunu became an extremely severe cyclonic storm with winds equal to a Category 3 hurricane in the Atlantic or East Pacific Ocean prior to making landfall. Yemen, is an Arab sovereign state in Western Asia at the southern end of the Arabian Peninsula. Yemen is the second-largest country in the peninsula, occupying 527,970 square kilometres (203,850 square miles). It is bordered by Saudi Arabia, the Red Sea, the Gulf of Aden and Guardafui Channel, and the Arabian Sea and Oman. Socotra located between the Guardafui Channel and the Arabian Sea, is the largest of four islands of the Socotra archipelago. The territory is located near major shipping routes and is officially part of Yemen, and had long been a subdivision of the Aden Governorate. 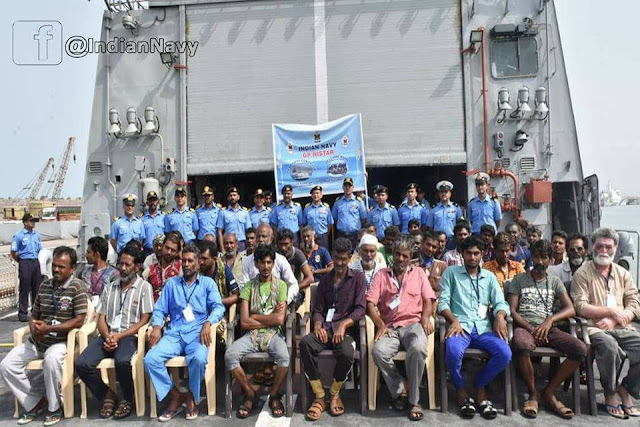 The Indian Navy on Sunday evacuated 38 stranded Indians from Socotra island in Yemen where they got stuck after a cyclone hit the area 10 days ago, forcing India to launch an operation to rescue them. All are reported to be safe. 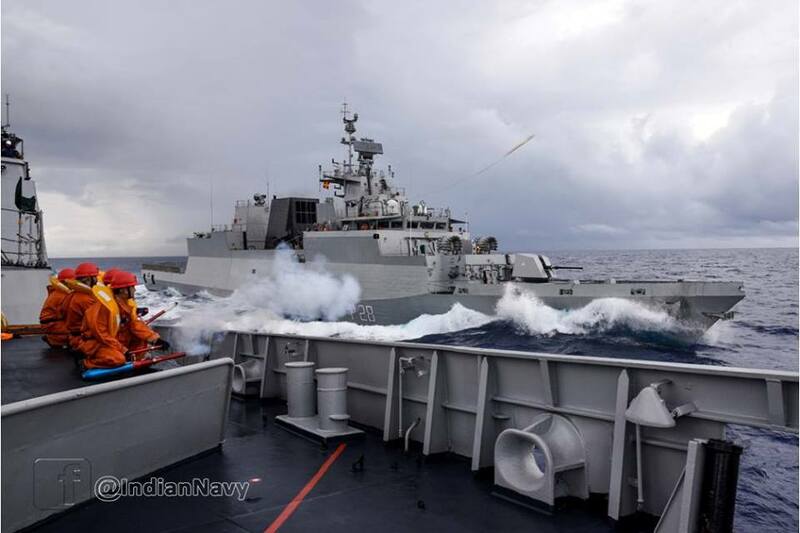 The Navy evacuated the Indians as part of operation 'NISTAR' carried out off the coast of Socotra early on Sunday and embarked them at Indian Naval ship INS Sunya to bring them back to India, a Navy spokesperson said. Indian Naval Ship Sunayna entered Porbandar harbour at 0900 hrs on 07 June 2018 after successfully evacuating 38 Indian Nationals from/ off Socotra Island during a swift Humanitarian and Disaster Relief Operation code named Operation 'Nistar'. INS Sunayna was diverted from Gulf of Aden deployment to Socotra Island for search and rescue operations after Indian Navy received a distress call from Directorate General of Shipping and Indian Sailing Vessels Association. The 38 Indian nationals were successfully rescued/ evacuated in the morning of 03 June 2018. All evacuees were safely embarked onboard the ship and were immediately provided with medical care, food, water and telephone facilities. Thereafter, the ship also undertook intensive surface search and aerial reconnaissance of the area to look for any more survivors. The 38 Indians evacuated from Socotra island in Yemen Indian Naval Ship (INS) Sunayana on June 3 landed safely at Porbandar on Thursday, a defence statement said. The rescued citizens were received at Porbandar harbour by Rear Admiral Sanjay Roye, Flag Officer Commanding Gujarat, Daman and Diu Naval Area. After initial briefing about the scheduled disembarkation formalities, they were put through mandatory customs clearance and immigration checks, the Navy said. The Indians were stranded for nearly 10 days after severe cyclonic storm "Mekenu" devastated the area around Socotra Island. That reminds of the herculean and daring efforts that the Indian Govt made a couple of years back, when Yemen plunged in to political crisis. Countries across the world were frantically trying to get their citizens out of the country because of the deteriorating situation in Yemen. According to a CNN report, the Indian government told the US that it will help rescue American citizens in Yemen. The US Embassy in Sanna put out an emergency message saying, "The Indian government has offered to assist U.S. citizens who want to depart Yemen for Djibouti. India rescued its citizens and surprised the World by8 offering assistance despite US having strong presence in the area. France also has presence of its Navy in the region to counter piracy". India managed to evacuate more than 3,300 of its citizens. India evacuated 1052 of its nationals with the government wrapping up the massive evacuation operation 'Rahat'. Operation Raahat, was an operation of the Indian Armed Forces to evacuate Indian citizens and foreign nationals from Yemen during the 2015 military intervention by Saudi Arabia and its allies in that country during the Yemeni Crisis. Aside, Ministry of Agriculture and Fisheries of Oman has announced that it will be distributing 70 thousand seedlings of varieties of watermelon, papaya, banana and lemon to farmers who have been affected by Cyclone Mekunu, in the Dhofar governorate. The ministry said in a statement: "This comes from the keenness of the Ministry of Agriculture and Fisheries to support farmers affected by the tropical cyclone that hit Dhofar Governorate, which had an impact on many farms in the governorate."